Simple message which many fail to execute. From [cipher]’s Flickr photostream. The problem happens when you or someone who you work with is not doing any of these three things. To segue from yesterday’s article on The Scarcity Of Guts, leadership ultimately comes down to these three timeless and succinct decisions which Patton eloquently projected to the world. 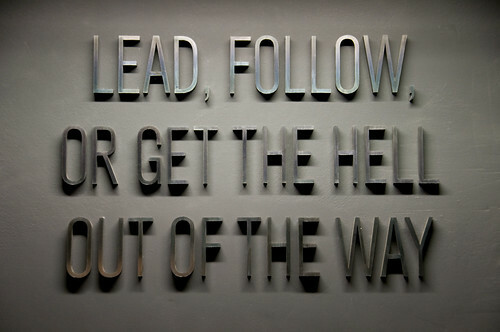 I don’t mind doing any of these – leading, following or getting out of the way. The key is to understand the situation and the authority which makes sense for a group or between you and another. It’s not always appropriate to lead. But it’s not good to undermine when someone else is trying to lead much less get in their way. The former makes you an adversary and the latter makes you a bureaucrat. If you find any of these areas stumped without forward progress, it is likely you or someone is not abiding by this maxim. Perhaps it requires a wake-up call for yourself. You will find out where someone stands and it will clarify your role and theirs quickly. The less ambiguity and the more personal responsibility everyone has is good for the goal. Where can you apply this for yourself to make progress on the goals which are important for you and your teams?